An entertainment chair system for providing a comfortable means of resting and being entertained. The system features a first half platform and a second half platform mounted atop a base, the first half platform can be reclined or elevated. An inner storage compartment is disposed in the base, wherein a door disposed in the base allows and prevents access to the inner compartment of the base. A television with a mounting system is pivotally attached to the first half platform. The mounting system functions to position the television parallel to the first half platform. A dispensing system is disposed below the base. This is a great income generating project! Imagine quality resting time whenever and wherever needed! Airports, Train Stations, Bus Stations, Hospitals, Amusement Parks, Hotels, Beaches, etc. Vip Clubs or average Joe's can Enjoy quality resting time, along with fine entertainment on a swivel TV set incorporated to Invention. Just swipe your credit card on the reader and set the time you need to rest on the timer. Middle compartment open up to secure your belongings, once closed you can seat and relax. Attached vending machine provides needed supply depending on environment, if hospital or airport, sleep kit; containing ear plugs, little pillow, blanket, etc. At the beach, tanning lotion, earphones, etc. Local Marketing adds, could be available at the TV which adds income to the business. Entertainment chair it's self-sufficient, which is cheap maintenance, Only fresh batteries and Supplies next day and good to go! Im on Primary Stage: Contacting manufacturers and getting estimates. China, mexico, India, USA. Market Potential. South Fl along, MIA, FLL and MCO received a whooping 100 M travelers each year!! Imagine every single airpot in the US and Worldwide Later!! 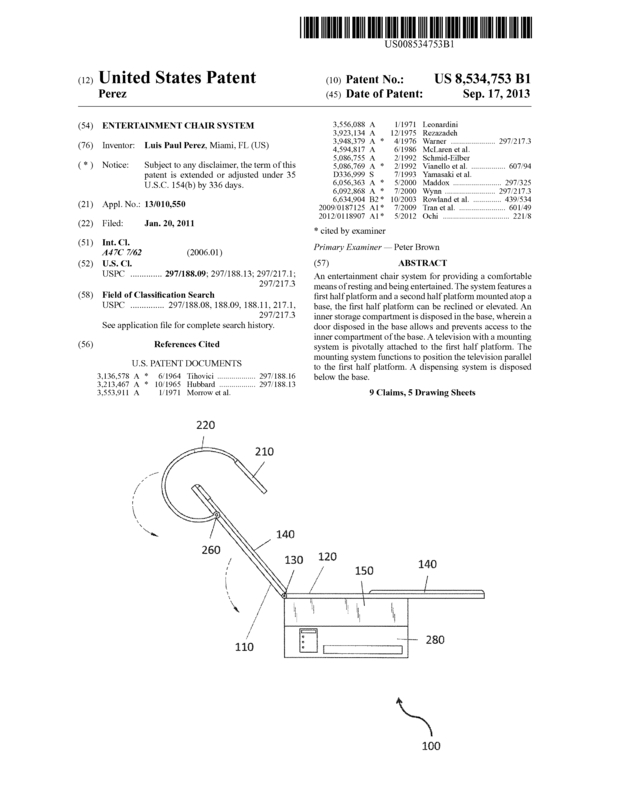 Page created at 2019-04-21 18:44:33, Patent Auction Time.